How to convert to Webm video format? Webm is a royalty free video format that is primarily used in the html 5 video tag. The webm file format was originally created back in 2010 when the webm project was set up with funding from Google. The project came about in response to the most popular web based video format at the time - H.264 - and the fact that it was a format requiring royalties for its use. This royalty based video format did not sit well with the Internet community as it meant that a large part of the Internet would be proprietary and thus controlled. Google were originally interested in "paying off" the owners of H.264 to make that format a royalty free one, but seeing as MPEG-LA were not interested in any offers that were on the table, Google moved to create a competing, royalty free format itself. The format is based on a the Matroska container which is a file format that can hold unlimited video, audio and subtitle information in a single file. The excitement and activity around the webm project has certainly not been tamed over time. Back in 2010 webm video was very important in the sense that it was responsible for keeping the Internet true to its original intention - a free and public entity for equal use by all. 5 years on and webm is just as important, perhaps even more so, due to the way that multimedia has exploded on the internet. With HTML5 really coming into play now, webm has paved the way for video and other rich media to be introduced into the mainstream Internet and has enabled web-masters at all levels to produce and display video for their users. Webm has many advantages over other video formats such as its mainly open source nature (meaning it can be easily developed and improved by anyone with an interest to do so), its low computational footprint - making it playable on almost any device and also its high quality realtime video delivery. There are several tools out there that will enable you as a webmaster to convert videos from other formats to webm video. 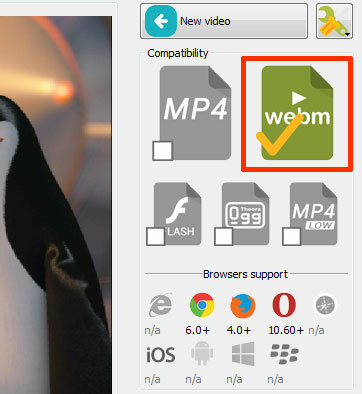 One of the best tools that we came across was convert any video into a html5 compatible format (such as webm). The tool is very easy to use and video conversion can be accomplished in three simple steps, as advertised on their website.